Nose: Spiced caramel corn, sawdust. Palate: Sweet, full-bodied. Cinnamon, habanero chilies. Finish: Hot and sharp. Woody. Mixed: Very good in an Old Fashioned. The sharp wood pokes through the vermouth in a Manhattan and even the amaro in a Boulevardier. I didn’t try it with cola or ginger ale. Parting words: I reviewed Tom’s Foolery’s apple brandy early in the history of the blog and I looked forward to trying their bourbon some sweet day. Now, that day is here. When I first tried this bourbon, I really didn’t like it. It had the classic splinter-up-the-nose micro-distilled bourbon aroma. Not as bad as Hudson Baby Bourbon, but present. This sharpness serves well in cocktails with sweet or strongly flavored mixers. The bonded tasting line up. To get a better handle on this whiskey, I included it in a casual BiB bourbon tasting with friends. The tasting also included Old Bardstown, Early Times, Old Grand-dad, Heaven Hill white label and Very Old Barton in a cameo at the end. Tom’s Foolery stood out in this line up. I still wasn’t sure but everybody else really enjoyed it. Maybe it’s peer pressure, but Tom’s Foolery is growing on me. I doubt it will ever be a favorite, but it’s not as bad as I feared it would be. At $44, it was the most expensive in the tasting, but factoring in micro-distillery inflation, it’s not too bad. It is 4 y/o and bonded, which is more than you can say about most micro bourbons in this price rant. I guess Tom’s Foolery Bonded Bourbon is recommended. Nose: Cut grass, leather, tarragon, alcohol, black pepper. Palate: Full-bodied and silky. Startlight mints, oak, tarragon. Finish: Anise candy, woodruff, oak, alcohol. Long. Mixed: Did well on the rocks, with soda and with Ginger Ale. Subtle but good in a Manhattans, and Sazeracs. Quite good with a splash of Akvavit. Parting words: Old Overholt was founded in Pennsylvania in 1810, making it one of the oldest whiskey brands in the US (maybe the oldest), even older than most single malt Scotch distilleries. It was one of National Distillers’ brands back in 1987 when Beam and ND “merged”. Once the ND distillate ran out, Beam filled OO with its youngest, worst rye, similar to how it turned Olds Crow and Taylor into bottom shelf bourbons. Until last year, Beam little interest in Old Overholt, aside from 2013’s weird, ill-fated “The Olds” ad campaign in collaboration with Onion Labs (yes, affiliated with The Onion). Jim Beam improved its Jim Beam rye a few years ago, raising it to 90 proof and four years of age. I reviewed it here. ND had produced a BiB years ago, but it had not been produced in decades and was pretty rare even as a “dusty”. Last year, Beam finally brought OO BiB back. The popularity of Heaven Hill’s Rittenhouse Rye was probably a factor in the reintroduction of OO BiB. OO’s old-timey label is also appealing to bearded hipster mixologists and now it finally has liquid inside that will appeal to them too. Old Overholt Bottled-in-Bond is a good companion to the other fine ryes in Beam’s stable and outclasses competitors like Rittenhouse and Sazerac ($3 more and 5% lower ABV). OO BiB is recommended. Nose: Alcohol, oak, cut grass, fresh caramel corn. Palate: Creme brulee, alcohol, tarragon. Finish: Alcohol, creamed corn, burnt caramel. Parting words: Bonded Beam was a staple of the Jim Beam line for decades, but was discontinued in the 1980s. Jim Beam Bonded was (re)released in 2015 at the demand of bartenders, according to Fred Noe. It has a touch of the grassy Beam Funk, but it doesn’t overwhelm. JB Bonded mixes well in everything from Coke to eggnog to Manhattans. It’s not particularly complex but it’s what one expects from a bond at this price. Speaking of price, now that Knob Creek has dropped its age statement, it might be worth looking at JB Bonded for your sipping needs if KC’s price (currently at $37 in Michigan) goes up any more. Jim Beam bonded is a good choice to work into your middle shelf mixer rotation. It is recommended. Nose: Dates, alcohol, dried figs, leather. Palate: Medium bodied and medium sweet. Cinnamon, mincemeat pie, sugar plums, caramel, oak. Finish: Hot and leathery, like me in my senior year of high school. Parting words: Old Forester 1897 is the latest entry in OF’s Whiskey Row series. I reviewed the first one, 1870, here. 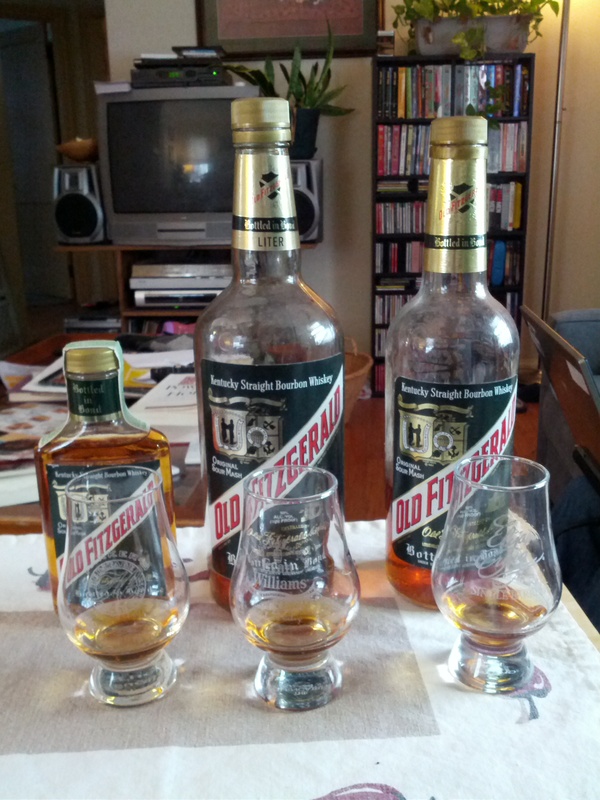 Old Forester is a great old bourbon brand. I won’t recount its long history here. Google it if you’re interested. This iteration is named in honor of the 1897 Bottled-in-Bond act that established the BiB designation for spirits (not just whiskey) and other quality controls. Bottled-in-Bottle aged spirits are at least four years old, the product of one distiller at one distillery from one distilling season, and bottled at 100 proof. The distillery must be identified on the label as well as the bottler, if bottled at a different facility than the one at which it was distilled. Old Forester BiB was in production for decades (maybe even a century) until it was replaced by Old Forester Signature. Signature is 100 proof but not technically a BiB presumably because it is not taken from one distilling “season”. 1897 is bottled in bond and it’s very good. While I like OF Signature, 1897 is superior. It’s much more complex and fruitier than its dry, spicy sibling. It’s creamy and fruity and a joy to drink. $50 is much higher than most BiBs are priced these days, but this is not Jim Beam bonded or J.T.S. Brown. This is a complex, flavorful bourbon worth sipping alongside Blanton’s or Rock Hill Farms. Old Forester 1897 is recommended. Appearance: bright copper with long, thick legs. Nose: Alcohol, jalapeno, charred corn on the cob, caramel, a hint of tropical fruit. Water brings out more tannic oak. On the palate: Medium bodied. Spicy but sweet, like pepper jelly. Jerk sauce, grilled polenta, old oak, alcohol. Finish: Hot, but sweet. Caramel corn and oak. Lingers for a very long time, tingling all over the mouth. Parting words: I love this bourbon so much, baby, that it tears me up inside. It’s perfectly balanced between fruit, spice and oak. In Kentucky its popularity is on par with Jim Beam white label and Evan Williams. That should tell you something. It is perhaps the best bargain in American whiskey. For around $12, VOB BiB (for short) is better than most bourbons that sell for twice the price. It mixes very well, but I love drinking it neat or with a splash of water so much that I don’t mix it much. Try the 90 (crimson) or 86 proof (green) versions if you’re looking for a mixer. Older bottlings before Sazerac took over have a prominent banana flavor and aroma that I enjoyed but some others didn’t so if you come across an older bottle, be aware. But either bottling is fantastic and highly recommended. Nose: Caramel, alcohol, potpourri, pine. On the palate: Medium bodied and a little hot. Caramel, tarragon, Thai basil, cumin, coriander. Finish: Oak, alcohol, leather, dried flowers. Parting words: This is Buffalo Trace’s stab at a high rye rye whiskey. It is made using rye and a small amount of malted barley, but no corn. The result is something spicier and with more rye character than their Sazerac line of rye whiskeys, but not as far over the line as the 100% rye whiskeys being sourced from Canada like Whistlepig, Jefferson’s, etc. It’s more elegant than those or the MGPI ryes like Bulleit and Willett. The caramel flavors (a bit surprising given the absence of corn) and oak keep the rye from overrunning things. As with the rest of the Col. Taylor line, price is a problem. Even accounting for the relative scarcity of straight rye, $70 is too much for this. 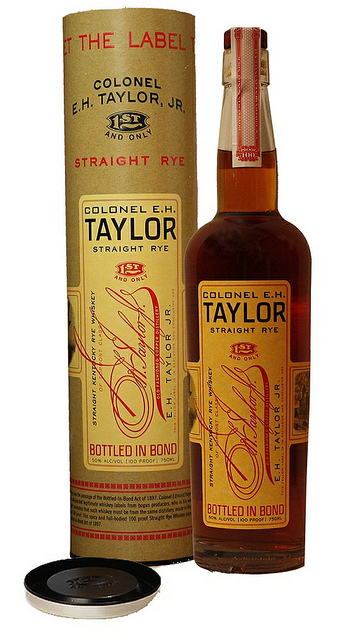 At $10-$20 less Taylor rye would be a sure-fire recommendation, but as it is, it’s only mildly recommended. On the palate: Thick and full-bodied. Sweet and luscious, Marshmallows, caramel brownies. With water amaretto, and a hint of spearmint come out. Finish: Fairly hot, but sweet and pleasant. Intense for a fairly long time. Parting words: This is another in the already crowded field of Buffalo Trace Col. Taylor releases and it is probably the most popular of the bourbon releases. The “tornado surviving” aspect of it adds some interest (warehouse C was damaged by a tornado a few years back)and I will say that it is much more rounded and complex than the first edition, the old-fashioned sour mash. It is a very much in the BT house style and it is a very good bourbon, embodying the best aspects of the #1 bourbon mashbill. The problem with the entire Col. Taylor line is the price. Sure it’s easier to find than the Antique collection, but it’s hard to justify paying close to those prices for bourbons without age statements at 100 proof. I can’t give it a non-recomendation because it’s simply very tasty. I can’t summon much enthusiasm for it, though, since it costs more than something like this should on paper. At $20 cheaper, this would be highly recommended. As it is, Col. Taylor Tornado Surviving edition is still recommended. Appearance: Copper with long sticky legs. Nose: Caramel, butterscotch blondies fresh from the oven, alcohol, cumin. On the palate: Medium bodied and sweet. Burnt caramel, butterscotch, clove, lavender. Finish: Corn syrup, dark toffee, fairly hot, long and warming. Parting words: Old Grand-dad is an old brand, one of the classic “Olds”, the others being Crow, Taylor, Forester, Charter, Fitzgerald and a few others. It was one of the brands Beam acquired when they bought out National Distillers in 1987, the purchase which made them into a major player in the spirits world. While Olds Crow and Taylor were changed to the standard Jim Beam yeast and recipe (some might say they even “trashed” those brands), Beam continued to use the same recipe and even the same yeast strain for Old Grand-Dad. Other variables like proof off the still and into the barrel and warehousing did change though. 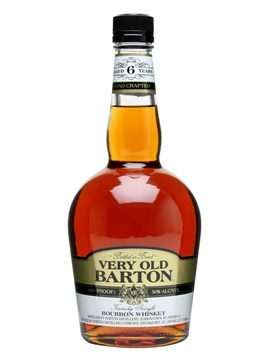 At any rate, Old Grand-dad’s vital statistics may have changed somewhat, but it is still one of the best bargains and best kept secrets in the bourbon world. For every poseur on a waiting list for Pappy Van Winkle there are 10 cases of Old Grand-dad being purchased and enjoyed by people who know the value of a solid, unpretentious whiskey. Old Grand-Dad BiB is recommended.